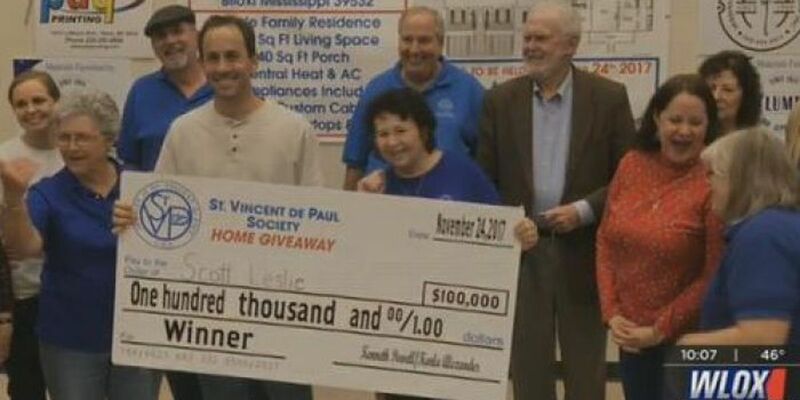 D'IBERVILLE, MS (WLOX) - You could still be the owner of a brand new home built to help the St. Vincent DePaul Society. You see, only 2300 raffle tickets were sold. And in order to give the home away, 2500 needed to be purchased. So instead, a $100,000 cash prize was given away in Friday night's drawing. Scott Leslie was the big winner and showed his excitement by running a victory lap around the D'Iberville Community Center. The home will now be sold and all the proceeds will go to St. Vincent DePaul. Andrew Alexander, the contractor for the home, said he hopes to build another home to give away and help the nonprofit next year.